We have over 30,000 courses available, with new courses being added every day of the year. You can view the entire course list on our website: www.skydroid.net. 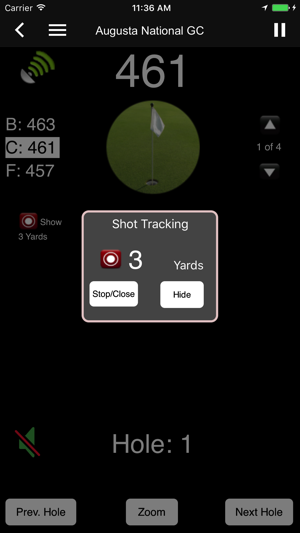 • Shot Tracking: Track the distance of your drives! 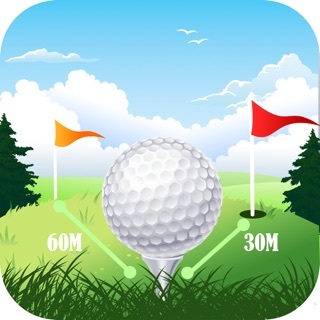 • Find your distance to ANY point on the course. • Audio updates to the center of the green. A great hands-free way to use SkyDroid. 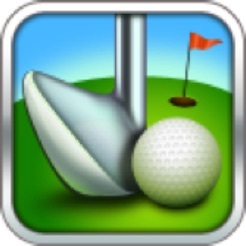 • Book discounted tee times directly through SkyDroid. 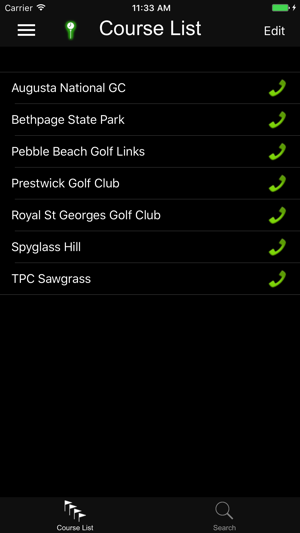 With SkyDroid – Golf GPS, our simple-to-use design will have you spending your time on your golf game, not on clicking buttons. • SEARCHING for Courses: When searching for courses by name, you can just search for "Aug" instead of "Augusta National Golf Course" (leave out the quote marks). 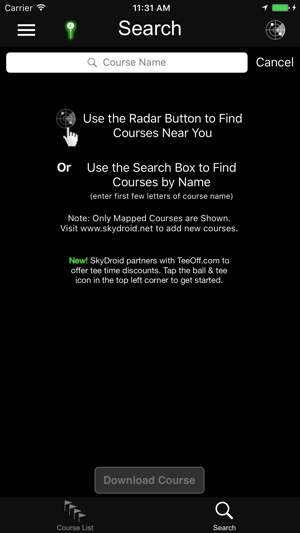 • SEARCHING for Courses: Radar button will find Mapped courses within 25mi/40km of your current location. • To save battery power, click your power button to turn off the screen when not in use. • Set your GPS Keep Alive in the SkyDroid settings to control how long GPS stays active when SkyDroid is in the background. Continued use of GPS running in the background can dramatically decrease battery life. • GPS accuracy can vary over time (click the GPS signal strength icon at any time to see your accuracy). • Before playing a course preview its mapping by clicking the link for the course name at www.skydroid.net/courses.php (best done using a large screen). Let us know of any mapping issues, or make changes yourself. • If we don’t have your course, you can add it as long as there is a satellite image of the course available in Course Mapper. • Change distance measurement (yards/meters) in the app Settings available on the in-app Menu. • While playing golf you will only incur data usage while using the Satellite View screen. Course downloads can be done at home over Wi-Fi and are small in size. The best money I've spent for golf. The app works extremely well, even better than someone I'm playing with using a rangefinder. I don't know where the bad reviews come from but I guess it depends on the person. It works fantastically in the NJ/PA area. But I've taken in all over and never a problem. Also works on private courses. My only recommendation is to hibernate your phone in between shots. If you leave it on and the app the whole time it kills your battery. But if you hibernate it there is no problem. 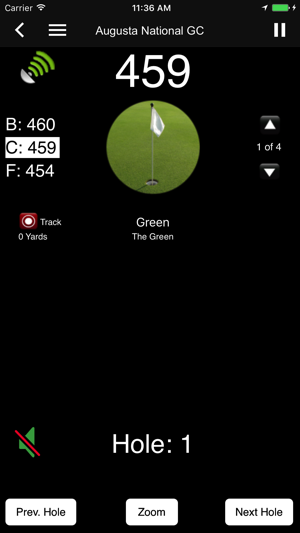 Because of this app, your will never have to buy a gps watch, range finder or gold gps. It app is a financial no brainer because the fact that you can see a satellite view of what is a head of you on any hole and how far out the hazard is allows for smarter play. Can't do that with a range finder or a golf watch. Maybe worth a range finder but they're like $250. Used this app all over AZ, CA and UT and has always worked great! A play 1 to 3 times a week and have say is this app always has worked for me exceptionally well! It’s my go to. I have paid for a few apps that are as much as $20 dollars and I come back to this app almost every time I play golf. 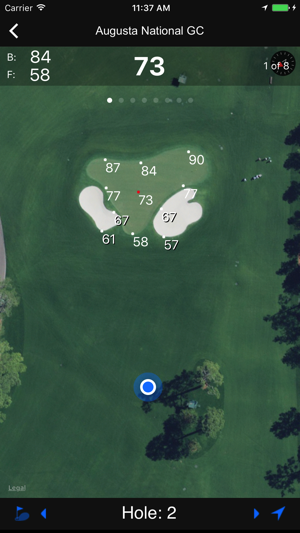 Every time I want to track a shot distance for myself or someone else this app works amazing. Details and accuracy have been right on the money! Thanks for building a fantastic app that is free! Look forward to using this app for years to come!